Night's Black Agents has been nominated for five ENnie awards for Best Rules, Best Interior Art, Best Rules, Best Writing and Product of the Year. Find out why! Night’s Black Agents brings the GUMSHOE engine to the spy thriller genre, combining the propulsive paranoia of movies like Ronin and The Bourne Identity with supernatural horror straight out of Bram Stoker. Investigation is crucial, but it never slows down the action, which explodes with expanded options for bone-crunching combat, high-tech tradecraft, and adrenaline-fueled chases. Updating classic Gothic terrors for the postmodern age, Night’s Black Agents presents thoroughly modular monstrosity: GMs can build their own vampires, mashup their own minions, kitbash their own conspiracies to suit their personal sense of style and story. Rules options let you set the level of betrayal, grit, and action in your game. 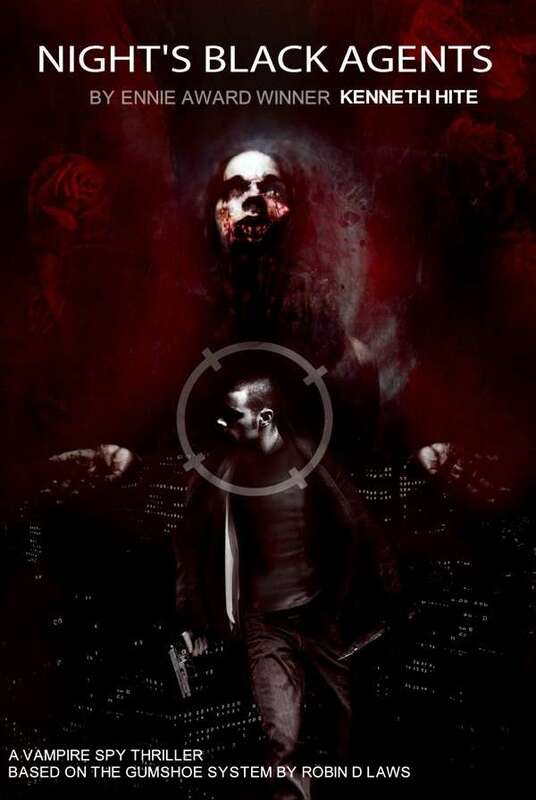 Riff from the worked examples or mix and match vampiric abilities, agendas, and assets for a completely custom sanguinary spy saga. The included hook adventure gets the campaign going; the included city setting shows you what might be clotting in Marseilles’ veins even now. Rack silver bullets in your Glock, twist a UV bulb into your Maglite, and keep watching the mirrors … and pray you’ve got your vampire stories straight. *ahem* back on topic. The sample adventure got me interested in buying this in the first place! This title was added to our catalog on November 16, 2012.